It’s just after 7:30 in the morning and Prince George’s County Executive Rushern Baker is the last to arrive. He does a few quick stretches and within minutes, Baker, his security detail, and some county staffers start to run two by two. The morning air is temperate. The pace: slow and steady. This gives Baker, 57, in his second term at the helm of the 900,000-person county bordering Washington, D.C. – the highest income majority black county in the nation – time and breath to discuss county business. Besides, his life these past few years has been a marathon, not a sprint. The stress of politics is partly why running is so important, he says. It’s why this Hillary Clinton delegate will probably squeeze in at least two six-mile runs during the Democratic National Convention this week in Philadelphia. 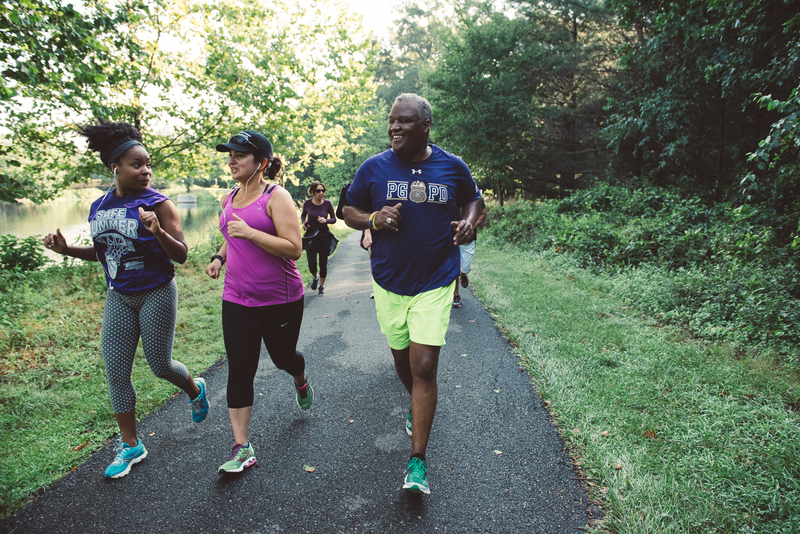 County Executive of Prince George’s County, Maryland, Rushern Baker runs with his security detail and friends on a trail at the Riverdale Recreation Center in in Riverdale, Maryland Wednesday July 20, 2016. Baker started running a few years ago to combat the health and stress issues. Prince George’s was under a federal corruption investigation when Baker took office in December 2010. (His predecessor, Jack Johnson, is currently serving prison time for extortion and witness- and evidence-tampering.) The county had a $75 million deficit, Wall Street was nervous about his new leadership, and the county began 2011 with 13 homicides in 13 days. But he also has another reason to run. Baker’s wife of 30 years, Christa Beverly, a civil rights attorney and his closest adviser, began having trouble remembering things in 2008, at age 48. In 2010, while he was campaigning for county executive, she was diagnosed with early-onset dementia. When Tennessee women’s basketball coach Pat Summit, who died in June, went public with her dementia diagnosis five years ago, it helped Baker and his three children, now young adults, to publicly acknowledge Beverly’s condition in 2012. By early 2011, Baker had packed almost 40 extra pounds on his 5-foot-9-inch frame. His mentor, Wayne Curry, who was Prince George’s first black county executive, made a blunt assessment: “If you don’t do something, you’re going to flatline,” Baker recalled Curry telling him. Baker had been a varsity football player in high school and had enjoyed tennis and running as an adult. Curry demanded his protegé start moving again. According to the U.S. Centers for Disease Control and Prevention, heart disease, cancer and stroke are the leading causes of death among African-Americans. 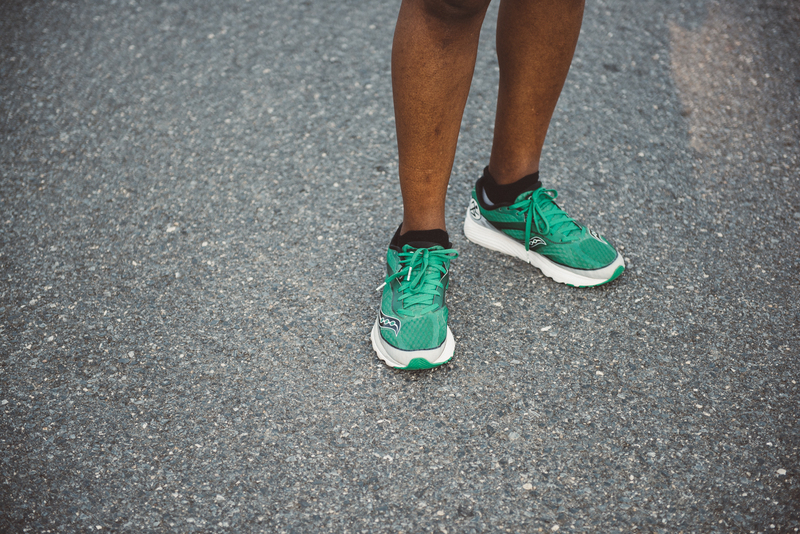 In Prince George’s County, 67 percent of adults are overweight, as are 15 percent of teens, said Rae Wallace, a marketing manager for the Maryland National Parks and Planning Commission and one of Baker’s regular running companions. 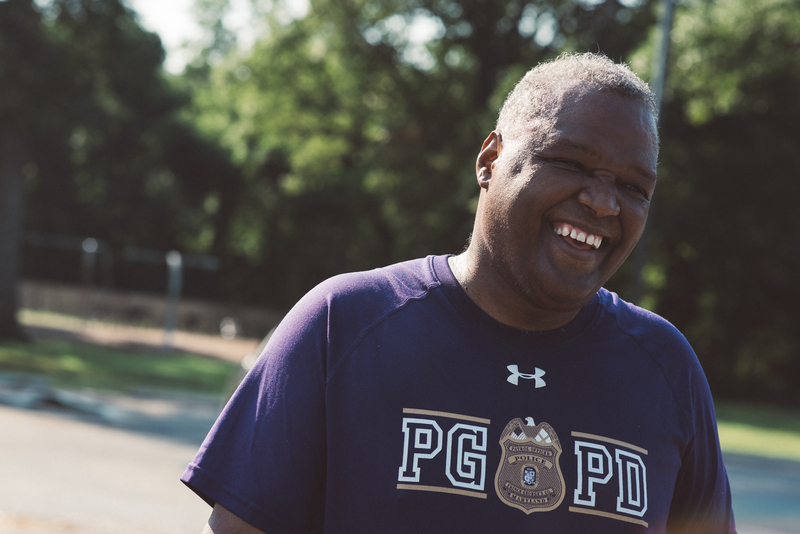 An officer on Baker’s security detail, Tony Grimes, a police academy trainer, suggested Baker start by going on a two-mile morning run with cadets. Baker was sure he could make it. He was wrong. It was February 2011 and he barely ran a mile before he had to give up. “I was embarrassed when I went out there,” Baker said. So he set up a schedule to change that. He joined cadets every Monday, Wednesday and Friday. They ran at his pace. “There were days, especially with the progression of my wife’s disease, where she couldn’t sleep,” Baker said. He’d put her in the car and drive around the county until 4 or 5 in the morning to calm her. They’d get home at 6 and Baker would don his running gear. “For that 30, maybe 40 minutes, my head would clear,” he said. By the summer, he was running three miles. He wanted to go farther. In 2012, the day before Baker’s 55th birthday, he and Grimes ran the annual Army Ten-Miler, the nation’s second biggest race of its kind. Last year, Baker (along with Grimes and Prince George’s police Sgt. Terrence Nelson) ran the Boston Marathon, finishing in less than six hours. He’s run other races, including a half-marathon in May, and plans to do the Ten-Miler again in October. Baker runs four to six miles three times a week, then usually goes on a longer run, eight or 10 miles, on Sunday. In April, he began the Step It Up! Family Fitness Club, walking and running different trails twice a month with county residents. “He’s balancing his work life with keeping himself healthy and that’s incredibly inspirational,” Wallace said. “It’s good for the morale to actually have me out here running, because I feel better. I’m calmer, and I can think through decisions,” Baker said. Once, during a battle over school funding last year, Baker ran 10 miles from a local high school to the county administration building to calm down. At home, his wife, now 56, can no longer care for herself, or even speak her husband’s name. He just keeps jogging. Baker called his transformation from less-a-mile-slug to marathoner especially important for African-American men. “One of the reasons I needed to run these last couple of weeks, even though it’s been hot as sin, is just because of what’s going on around the country,” he said. The protests about brutality, the killing of police officers, it all “weighs in on you on how we deal with race here in the county,” which has had a troubled history of police-community relations. Just like he does four days a week, pushing through on the runs for his life.